Troubled at the sight of reddish, painful bumps over your skin? You may be having boils on your body. Read and know all about boils, why they appear and how they can be treated by doctors and at home. Boils are raised bumps arising on the skin surface. These can arise almost anywhere on the surface of the body except the nails. Boils most commonly arise on body regions like face, armpit, neck, buttocks and thighs. 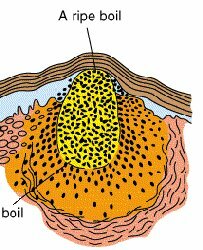 Boils are of two types, single or multiple. A single boil is known as Deep Follucilitis or Furuncle. Multiple boils are called Carbuncles. Carbuncles are larger in size and deeper. Larger boils leave scars and take longer to heal. They also give rise to other symptoms like fever and fatigue. Carbuncles look like regular, singular boils but usually have multiple heads at the tip of the bump. Boils are generally round in shape. These look like red, elevated bumps on the skin surface and may feel hot when touched. Each individual furuncle typically has a diameter within ¾ and ½ inch. Boils are a result of infected hair follicle mainly caused by the Staphylococcus aureus bacteria though other kinds of bacteria or fungi can also give rise to these bumps. Infection generally arises when the hair follicle or the skin region surrounding it suffers damage in some way. The broken skin allows bacteria to enter into the deeper areas of the tissues of the follicle and the underlying tissue. Boils usually arise as pinkish-red, elevated bumps on the skin surface. These are initially tender and about as large as a pea. In later stages they grow a little larger and the boils head may develop a yellow or white centre. The growth may be quick. The bumps become redder and very painful as they begin to get filled with dead tissues and pus. In the final stages, boils swell to become as large as a golf ball. Boils located close to each other may join and spread to other regions of the skin. They look like water filled cysts and a crust is formed over their heads. These may ooze pus from time to time. Ultimately, the bumps may drain pus themselves or may be forced to ooze pus. Sufferers experience relief once the lumps have completely drained and healed. Boils are very common in people with low immunity. Weakened immune system makes individuals more prone to bacterial infection. Boils are often caused by Diabetes. Diabetes reduces immunity in sufferers and makes them vulnerable to microbial attacks such as bacterial infection. Poor hygiene is one of the main factors behind the appearance of boils. Not changing clothes or taking baths regularly makes the skin susceptible to infections and gives rise to carbuncles. It also leads to boils due to body heat build-up. Wearing tight apparels can make cloth constantly rub against skin and irritate it thus leading to the development of Furuncles on the body. People suffering from skin disorders like Psoriasis, Dermatitis and Acne are highly susceptible to boils. Poor nutrition is also a strong causative factor. Bad nutrition results from non-inclusion of essential foods and nutrients in diet and leads to a weak immune system. Boils also appear when the skin is exposed to harsh chemicals. Strong chemicals irritate the skin and gives rise to boils on the skin surface. Medicines like Corticosteroids suppress the immune system which makes the body vulnerable to bacterial infections and skin disorders thus giving rise to boils. Boils may also form after an insect bite. Tick bite is often seen to lead to the development of Furuncles over the bitten skin region. Carbuncles also develop as a result of liver and kidney disorders. For people with boils medical treatment actually depends on the causative condition. If the bumps are found to be a result of bacterial infection, the nature and severity of the infection should have to be taken into account. In case of a large boil and serious infection, for people looking for boils treatment antibiotics like Cephalexin (Keflex) or Dicloxacillin (Dynapen) are prescribed. Washing boils with antibiotic creams can make them subside within a few days. In treatment of boils quick cure can be achieved through use of antibiotics. If patients are found to be allergic to penicillin-based medicines, Erythromycins may be used. In case of a severe infection, skin abscesses may form in the affected area. A minor surgical operation may be needed to completely drain the cyst in such cases. Application of warm compress over small boils can help them drain quicker and subside in a few days. Warmth also helps reduce pain in the inflamed area. For people with minor boils quick treatment is often possible with warm compress, preferably thrice during the day. It is one of the best boils home remedies. Applying Calendula in a diluted form or in an herbal form over the bumps may also be quite effective as a remedy. Applying tea tree oil is also quite helpful in curing boils naturally. Tea tree oil contains anti-septic and anti-bacterial properties which helps it fight bacterial infection in skin and hair follicles. Goldenseal has strong anti-bacterial properties which is effective in combating many types of bacteria. Goldenseal root powder is readily available in the market. Mix this with hot water and apply over your boils to get cured quickly. Rise of toxic elements in the bloodstream is also a major cause for the formation of boils. Dandelion cleans toxins out of the bloodstream and liver and helps shrink boils naturally. If you have very painful boils on your skin, Propolis can be a powerful natural treatment. Propolis works as a natural antibiotic medicine and can fight bacterial infection. In tender boils, application of the herb Hepar Sulphuris Calcareum can bring about fast relief and ensure boils removal. Burdock root is a natural antibiotic agent which is effective in stopping bacterial infection. It is a powerful natural cure for boils and is often recommended by people. Apply grounded pulp of Flaxseed over boils as a poultice. This can give rise to a head more quickly and helping in boils bursting faster. This North American perennial herb purifies the lymph glands and boosts the immune system. People who get boils due to low immunity can benefit greatly from this herb. Mix Turmeric paste with honey, mils, castor oil, iodine and Epsom salt and apply over the boils. In boils Turmeric paste helps faster shrinking. Furunculosis is a more serious kind of bacterial infection that is characterised by formation of furuncles that stay for a longer period of time than normal boils. These are usually present for several weeks and may last for months. The condition is caused by skin infection from by Staphylococcus Aureus bacteria. Furunculosis is a systemic condition and travels fast through the bloodstream to affect all regions of the body including the vital organs. This rapidly multiplies in the bloodstream and causes small blood capillaries to rupture. In worse cases, this may lead death of sufferers. Furunculosis also gives rise to boils all over the body. Furunculosis may be cured by topical application of Formaldehyde solutions and Hydrogen Peroxide. Oral antibiotics, warm compresses and medicines like Romet and Terramycin are also effective in treating this condition. In some cases, expectant mothers are seen to develop boils during pregnancy. This is a serious condition and is usually a result of bacterial infection or medicinal side effects. A pregnant woman developing boils usually do not suffer a miscarriage though they can pass on the infection to their babies in 3 to 5% of cases. Boils in babies normally do not lead to any permanent damage. In pregnant women treatment of boils should be done very carefully as strong antibiotics can risk the pregnancy. In expecting mothers with boils medicines like Penicillin antibiotics are safe to use as they do not have any strong side effects thus making it possible to avoid deformities in newborns. As aforesaid, boils are often a result of diabetes. It is actually Type 2 diabetes that gives rise to boils and other skin problems like acne. Type 2 diabetes is believed to result in non-use of insulin produced in the body. High level of insulin in human body is the result of boil formation over the skin. Diabetic boils are also formed due to low immunity in individuals. Diabetes weakens the immune system and makes the body susceptible to a number of infections and diseases which healthy individuals are free of. Diabetic boils commonly occur in skin regions with highly active oil and sebaceous glands such as in the face, neck, chin and armpits. Boils can be prevented by lifestyle and dietary modifications. Incorporating healthy foods comprising of essential vitamins and minerals into the diet can supply important nutrients to the body and make it strong enough to avoid infections. Furuncles can also be prevented by following good hygiene and sanitation. Taking regular baths, changing clothes, wearing loose dresses and non-use of soaps and creams with harsh chemicals can help you steer clear of boils. Not sure if you are actually having boils on your skin? Check out these useful boils photos to know how boils look like. These boils pics will give you an idea about the appearance of boils and help you be sure whether you are really having furuncles. If you are having boils which just refuse to go away despite natural remedies, it is time you make a visit to your doctor and start medical treatment. Boils can be very discomforting and painful. So the earlier you begin treatment the better it is for you. I just put to bed last month through CS operation and I’m having a big painful boils in my vaginal and armpit area, so painful. What can I use or do pls! am suffering from boils almost to three weeks now..around my lap,so what can i do pls!